Do Galaxies Receding Faster Than The Speed Of Light Disappear From Our Observations? The Universe is expanding, and it is mysterious dark energy that is driving this expansion. While Einstein asserted that nothing can travel faster than the speed of light, it is only the motion of objects that his law constrains, not the space that the objects actually occupy. Yes, the space between our galaxy and another distant galaxy can stretch and expand at a rate so tremendous that the distant galaxy may recede even faster than the speed of light. However, if the galaxy recedes away from us faster than the speed of light, shouldn’t the light it emits never reach us? To us, such an unobservable galaxy is as good as being nonexistent. Considering the seemingly infinite size of the Universe and the time for which it has existed, billions and billions of galaxies are beyond our reach. Should astronomers then surrender their telescopes and abort their quest? While the nature of dark energy still eludes us, we know the rate at which it stretches space. However, what’s astounding is that the rate of expansion isn’t constant; the expansion is accelerating, that is, the more distant a galaxy, the faster it is receding. The rate of recession was determined to be 71 km/s for two galaxies separated by a megaparsec. This is Hubble’s constant. A parsec is a unit of length used to measure astronomical distances. One parsec is equal to about 3.26 light years (the distance light travels in one year), and a megaparsec is a million parsecs or 3.086×1019 km. It is no surprise that billions and billions of galaxies therefore seem beyond our reach; 4225 megaparsecs is merely a speck, perhaps something microscopic, on the massive canvas that is the Universe. 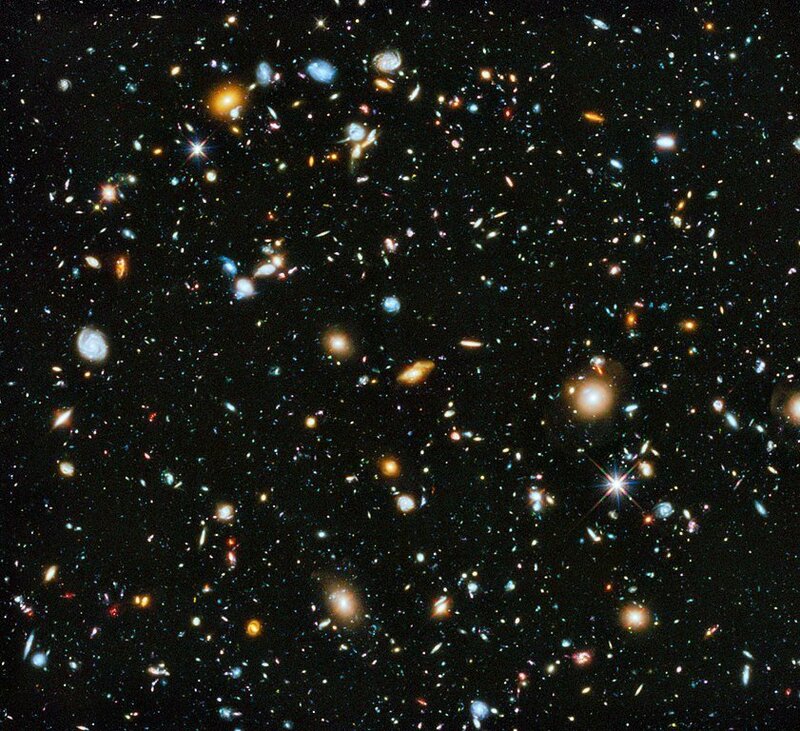 The diameter of the observable Universe is estimated to be about 28 billion parsecs. Yet the Hubble telescope, while surveying absolute nothingness, managed to capture this (below) — it had peered far across the ocean, even beyond the horizon… way beyond the horizon. The objects glinting deeper within the image are galaxies and cluster of galaxies that bloomed to life when the Universe was just an adolescent. The image in its entirety is a photo album that catalogues the Universe’s epic life. What you’re witnessing is the Universe’s past, and it is only in this regard that the galaxies now farther than 4225 parsecs can be observed. We can only observe their past, not their present, because the light they emitted then has reached us now. Today, they might as well be extinguished and deceased. However, we will only find out after the light emitted by their last stars reaches us, that is, billions of years later. Unless it’s too late. Light emitted by a receding star towards you is like a rolled carpet unspooling from a car receding away from you. The carpet’s end reaches your feet if its rate of unspooling is faster than the rate at which the car is receding. However, the recession stretches the length of the carpet; the light we receive has experienced a red-shift. Its wavelength, as the galaxy recedes farther and farther, is stretched or elongated towards red, then infrared, then microwaves and finally radio waves. Inversely, when a star approaches the observer, the light it emits experiences a blue-shift; its wavelength shortens towards blue, then ultraviolet and so on. The wavelength obeys the Doppler effect: the same effect that causes sirens to sound louder as they approach and dimmer as they recede. It was this observation of red- and blue-shifting that made the astronomer Edward Hubble realize and declare, to Einstein’s despair, that the Universe is expanding. The constant is named after him for this revolutionary discovery. Now, with Earth as the center, let’s draw on the spherical map of the Universe, a sphere with a radius of 4225 parsecs. Let’s call it the Hubble Sphere. Within this sphere are galaxies that are not receding away faster than the speed of light. Let’s call them NFSL galaxies. Beyond this sphere are galaxies that are receding away faster than the speed of light. These are the FSL galaxies. 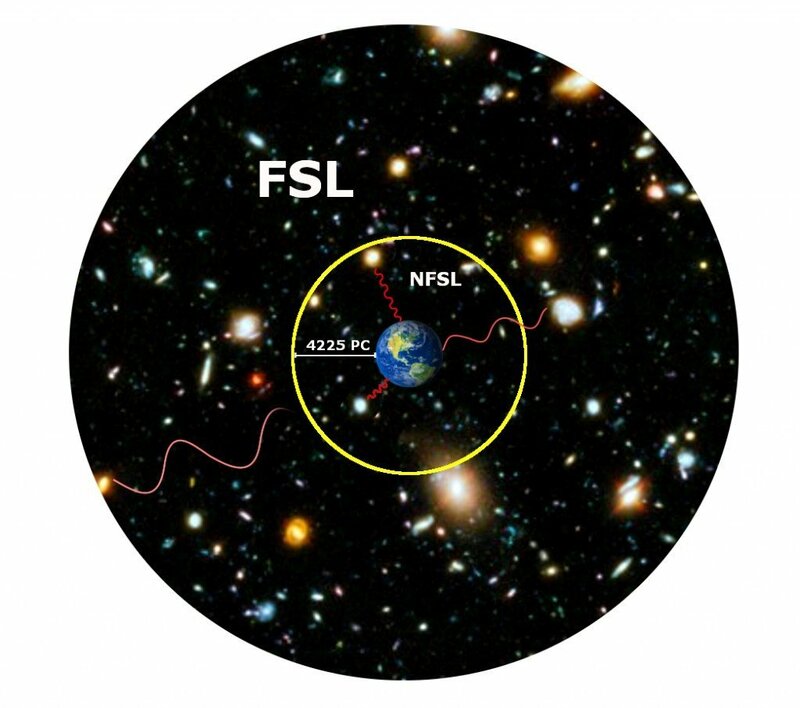 Remember that the Universe is continually expanding, which means that a long time ago, FSL galaxies inhabited the Hubble Sphere and actually were NFSL galaxies. Therefore, the light they emitted when they inhabited the sphere will reach us because, in the sphere, the light travels faster than the rate at which the galaxies recede, but it limns them as they were then. This light is stretched, of course, but we do receive it. Today, even though they have traversed the sphere, the car now recedes faster than the carpet unspools. What ensues is a grievous tussle: the light is now increasingly and tremendously stretched, but if the galaxy isn’t too far, strenuously, the light will eventually be able to enter the sphere and therefore outpace the stretching of space to reach us. However, this would take billions of years, and therefore, yet again, the light would become a lens into then. 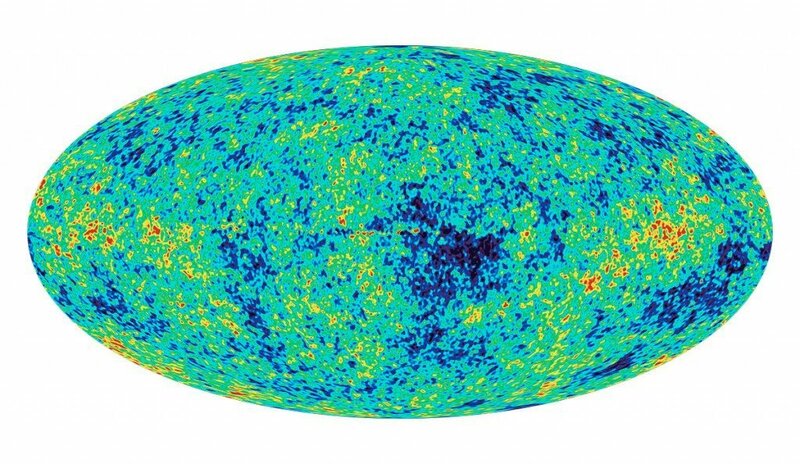 The Cosmic Microwave Background Radiation (CMBR) is a map of variegated colors dispersed during the Big Bang itself. It is the oldest light that has ever illuminated humankind! However, it is so old and deep that it is stretched to the level of microwaves. It is located, in fact, way beyond the sphere. However, as the expansion is accelerated, as the more distant a galaxy, the faster it recedes, the light it emits is further stretched. Eventually, it gets to the extent that it never reaches us or is stretched apart even beyond radio waves, thereby becoming too faint to be perceived. Such a galaxy has receded so far and continues to do so so rapidly that the light it emits never reaches us. It is truly unobservable. Realize that we can only glimpse the past, and never the present, until eons from now, when the galaxies have receded too far, and it will be too late even for that. Astronomers eons from now would be unable to locate neighboring galaxies and the CMBR, and therefore the Big Bang, the supposed origin of our cosmos. Astronomers and cosmologists assert that we live in the golden era of cosmology, a time when the galaxies aren’t too close and nascent, nor are they too old and far away. If we must begin our quest for the truths of the Universe, now is the time, because eons from now, we will discover that the shores across the horizon are long faded and lost — leaving our tiny, remote island as a stone in an ocean of dark, empty space.